Experience the pleasure and hydrotherapy benefits of soaking in the bath again! Aquassure ADL Spa Baths are accessible and elevated to provide a therapeutic spa experience for people of all abilities, including wheelchair users. Aquassure bathtubs are unique. 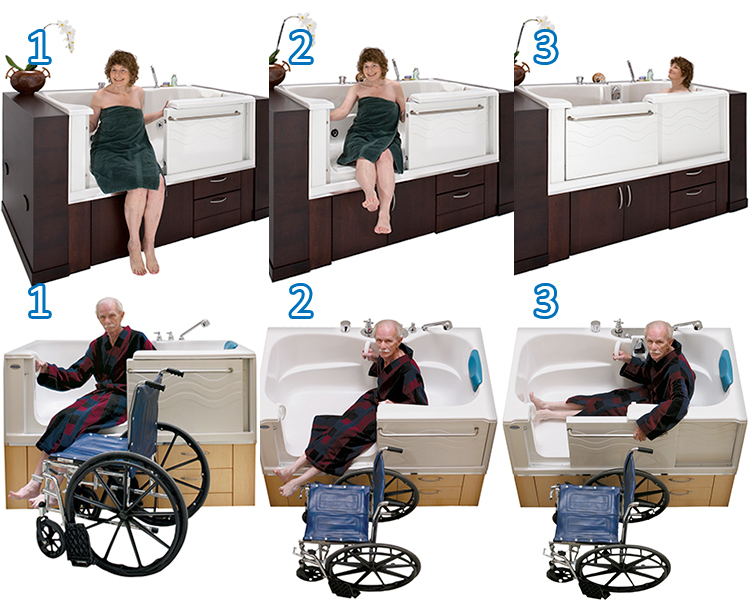 Our patented sliding door and raised bathtub design offers universal access for people of all levels of mobility. Access from wheelchairs, walkers and lifts in a full-sized bathtub that is easily retrofittable into existing residential bathtub spaces. You are always fully supported and cannot fall in an Aquassure ADL Spa Bath. The elevated bottom eliminates having to stand, and the need for a seat. You can simply slide back in from a seated position. Every ADL Spa Slide-in Bath comes standard with a 5-foot white soaker bathtub with patented sliding door (left or right opening), 2” quick drain system, cabinet base with white melamine cabinet fronts, cabinet hardware, four integrated grab bars, 3/4” high flow valves with factory installed deck mounted chrome ADA-compliant lever-handled fixtures with adjustable handheld shower, Roman filler, and 5-foot flex hoses to hook up to hot-cold intakes. Choose from two tub systems designed to meet your needs! 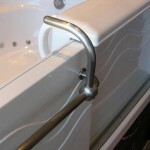 ADL Spa Basic – our standard accessible slide-in bath, as described above. ADL Spa Safety Plus – our standard tub, plus… a thermostatic anti-scald temperature-control valve system. Entering an ADL is as easy as sitting or transfering, sliding back, and shutting the door! Stretch out and relax. 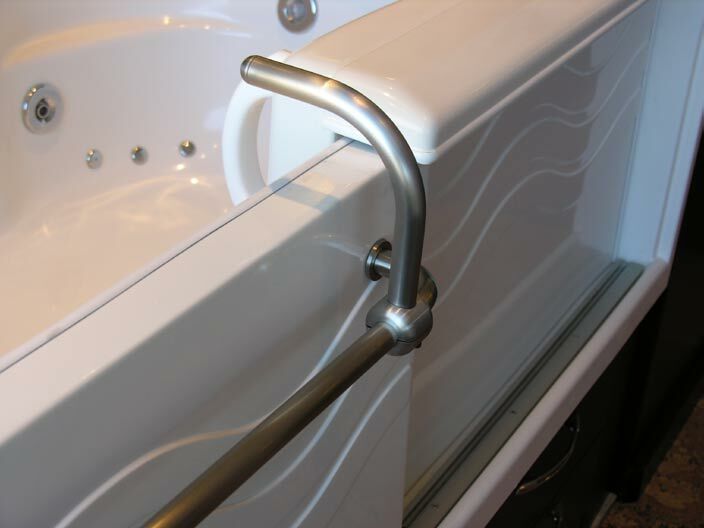 Only Aquassure bathtubs come with our patented zero-clearance sliding door! The easy-glide sliding door is out of the way of legs, walkers, wheelchairs and lifts. The door latches automatically when you close it, and easily releases when you lift up the handle. Our unique seal design uses water pressure to increase seal integrity, preventing leaks and accidental openings. Plus, our door features a secondary backup drain in the door track – no spills on the floor and water can be run with the door open for cleaning and pre-heating! Our door was tested over 20,000 cycles of opening and closing, then filled with water and it did not leak, exceeding international certification standards! 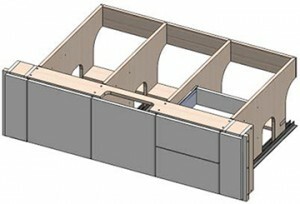 The cabinet base is part of what makes the ADL Spa so unique and accessible. It lifts you 18 3/8” off the ground, and allows for easy entry and exit via wheelchair transfer, walker, or standing position. 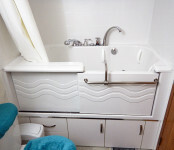 The cabinet doors open up to reveal easy access to plumbing, and is accessible for wheeled lift use. Built-in drawers allow for additional bathroom storage. The entire base is made from 5/8” laminated water-resistant wood, which will not warp or swell. Cabinet fronts can be upgraded to a variety of stains and finishes. Visit our colour chart page to view what options are available. Air Jets – top of the line CG Air heated air massage system with 15 jets. Water Jets – top of the line Syllent pump heated water jet hydrotherapy system with 7 jets. Colour – tubs come in classic white but can be upgraded to a variety of colours from off-whites to faux stone. Visit our colour chart page to view what options are available. Cabinet Fronts – cabinet base fronts come in classic white but can be upgraded to a variety of finishes. Visit our colour chart page to view what options are available. Fixtures – upgrade from chrome to brushed nickel. Extender Handle for Door – An optional extension handle is available for the door handle. This is recommended if the bather has poor arm or shoulder mobility or poor strength to reach over the side of the tub. 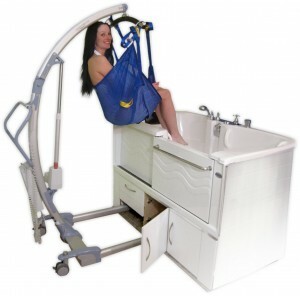 Support Harness & Seatbelt System – Some bathers have difficulty remaining in a seated position in the bathtub due to core weakness or paralysis. Aquassure has 4-point seatbelt/harness as well as a belt harness that the bather can use to secure themselves in place once in position for bathing. The ADL Spa is in compliance with these codes and standards: CSA B45.5-11./IAPMO Z124-2011-Plastic Showers and bathtubs, ASME A112.19.15-2012/CSA B45-2002-Whirlpool bathtubs with pressure-sealed doors, UPC Codes, National Plumbing Code of Canada and International Plumbing Code. Looking for more? Check out more of our videos by visiting our video page. 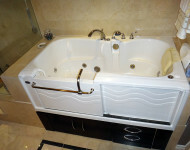 Visit our photo gallery for pictures of completed ADL Spa installations!